Our Tom Clancy’s The Division 2 review has been a long time coming (struggling through Sekiro may have had some impact in that), but with a game this absolutely massive and filled with things to do, there’s a lot to take in and analyze. One of the original concepts for The Division was essentially “Diablo, but as a third-person military shooter.” It was an interesting blend of the loot-based RPGs we’d been playing for years with a non-traditional setting and gameplay. What The Division 2 does well, it does exceptionally well. After all, there was the entire first game’s worth of improvements and additions that the studio made sure to have ready for the sequel’s launch. It’s not all sunshine in Washington DC though, and I’m not just talking about the dynamic weather systems that fill the game. The Division 2 is almost two distinct and separate games. The base campaign is an open-world third-person shooter. Here you’ll be leveling up to 30, pushing back three murderous factions in DC, and switching out gear so often you’ll be dizzy. The story is largely forgettable, with no real narrative beyond “kill the ‘bad’ people” and maybe find an antiviral that could help. You’ll also be rescuing national relics, like the National Treasure mission where you’re pulling a Nicolas Cage and stealing back the Declaration of Independence. It lacks any kind of subtlety, finesse, or depth, though there’s plenty of deep lore for a world rebuilding after being on the brink of complete and utter collapse. Lore isn’t story though, and mission for mission, there’s very little story to the overarching game. Even the first Division had more story as you sought the man responsible for the outbreak and attempted to contain it it within the Manhattan quarantine zone. It was the story of the very beginning of the viral outbreak. 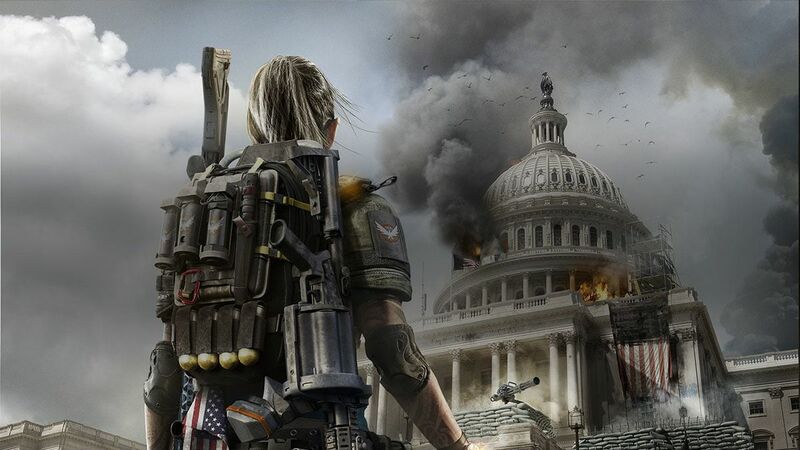 The Division 2 is a purely reactive story. DC has been overrun by three fractions of the disenfranchised, threatening the good citizens who just want to rebuild society. Kill them. Stop their supplies. Build up your own settlements. Eventually take out each of their leaders and main bases in lengthier Stronghold missions. I definitely wasn’t being kept on the hook because I had to know what happens next (“next” was basically given away and spoiled by endgame marketing for the game), but there were plenty of other things that kept me booting up the game again and again. What the setting does have going for it is an impressively detailed summer Washington DC, an environment that is far more varied than its snowy New York counterpart. Seven months removed from the initial outbreak, we get to see what a world living within a broken down system looks like. Plants are overgrown. Sewers and waterways are backing up (power is still on though?). Some of our nation’s most iconic monuments have become bastions for criminal activity. Every new street and building was fun to explore, and I could easily get lost for hours just wandering around The Division 2′ s Washington DC. I was surprised at how excited I would get over a simple thing like seeing the Lincoln Memorial or visiting the Air and Space Museum. Of course, I’m not on vacation here, and my trips to these locations were primarily about undertaking missions. Bullets tend to be a pretty good distraction from taking in the sights. While the overall story may have been pretty underwhelming, each mission’s individual narrative did manage to drive some intrigue, based largely around the location that it took place in (the Invaded versions of the missions also twisted them in interesting ways, but I’ll get to that with the endgame). I’d be remiss if I didn’t mention The Division 2’s dynamic weather that makes for a whole lot more than just an aesthetic change. Missions and locations in the world can feel completely different played on a clear bright day or on a foggy, rainy night. Fog severely limits visibility, making it tough to take out distant enemies. Likewise, it makes it hard for them to see you, so weather actually affects how you play and strategize in certain outdoor locations. Obviously it doesn’t impact interiors, but it’s a significant and noticeable detail that wows me every time I am caught in a storm. One of the things The Division 2 excels at is delivering on its third-person shooter mechanics. Looter RPG aside, it just feels good to play, whether you’re picking off an enemy’s health from afar or utilizing the cover system to move in for closer combat. There might not be a whole lot of dimension within mission objectives (most of them rely on fighting off waves of enemies while defending a point), but encounter to encounter, there were plenty of dynamics present in the locations and enemies to keep every new battle engaging. It just felt good to play, especially when I found a gun that I really liked. The cover system is almost essential for survival, but works really well. In some ways it reminds me of XCOM but in realtime as I advanced point to point and tried to avoid being overwhelmed or flanked. It certainly helped having a co-op partner who was there to revive me if (when) I got downed. Even better, just about every single activity in The Division 2 is matchmade, so if you don’t have people to play with, you can still have a reliable team backing you up on every mission. There’s not a lot of coordination required via voice, but I still would have liked to see something like Apex Legends’ ping system implemented for easy non-verbal communication. As it was, we managed just fine without, and choosing to go in with less than a full team of four is essentially just activating hard mode for yourself. On top of the shooter mechanics, there’s a pretty deep RPG system allowing your agent to gain plenty of new skills, tech, and abilities. Then there’s the entire mod system for gear (which you probably won’t use much until the endgame anyway). And there’s a pretty extensive crafting system for gear and mods, again, probably not entirely useful until your gear stops outclassing itself every single mission. You’ll be throwing a lot of stuff out before level 30—even some high-end rarity gear that might feel difficult to part with—so don’t get too attached to the deeper mechanics just yet. The first campaign portion of the game feels a lot like your usual open-world adventure. It’s great and enjoyable, and people who want a typical 30 hour campaign will be satisfied by its conclusion, but it’s just the beginning. 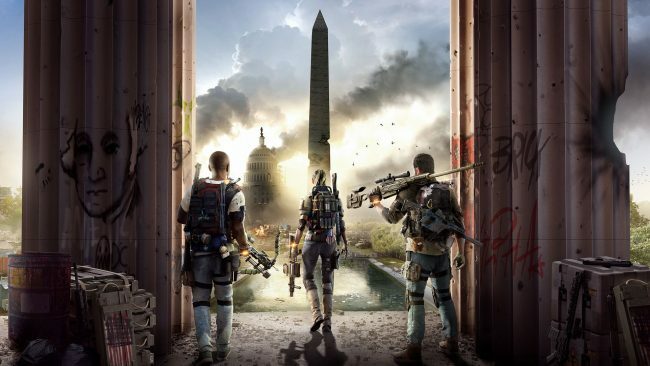 By completing the campaign, you’ve only touched maybe half of what The Division 2 has in store. After you take back the Capitol Building and reach level 30, a whole new Division opens up. One of the biggest criticisms about the first game was the lack of a strong endgame. A lot of that was fixed through numerous updates and content additions in the years since its release, but knowing that, Ubisoft went in hard on making sure that The Division 2 didn’t repeat the same mistakes. As a result the endgame is immediately massive—at least the size of the campaign, if not arguably even bigger. And that’s not even considering what comes after that (which we’ll get to in a minute). After taking back the Capitol Building from the True Sons—a faction of rogue ex-Division soldiers—and reaching level 30, the world map gets invaded by a whole new faction. Black Tusk, a private military corporation comes in to shake things up and the entire map becomes a dynamic war between the four factions, and of course you, the Division agents and regular citizens. All of those missions you previously undertook during the main campaign now become Invaded missions, with Black Tusk enemies present, and completely new storylines and dialog following up on your actions from the previous version of the mission. It makes the endgame a lot more interesting than just running through the same old content, only harder. I mean, eventually it gets to that point with the Invaded missions themselves, but for starting into the endgame, everything will feel pretty fresh and new. The endgame moves the state of the world to something called World Tier 1, which allows loot to drop at certain levels. As you advance (up to World Tier 4, and eventually World Tier 5, once they release it), the activities get harder, but the loot gets better. That’s the chase and the grind in The Division 2′s endgame. Leveling up the worldstate and gaining more powerful loot to take on even more powerful challenges. Even outside of missions, the world activities are varied and many, especially when it comes to the invaded nature of Washington DC in the endgame. The balance of power is always shifting, and the game is replete with daily, weekly, and permanent challenges, bounties, and tasks to undertake. There’s always something else to do. More than just a new enemy faction changes though. Division agents gain the ability to class into a Specialization, with no real limits on what you want to be. Looking to play a ranged assassin, deadly with a crossbow? Go for it. Want to switch over to a heavier tankier agent, annhiliating enemies with a grenade launcher? You can do that easily. There are three specializations you can switch among anytime back at your main base, but you an only choose one at a time to class into. They each come with a range of new skills, abilities and upgrades to earn, so once again, hitting level 30 isn’t the end. It’s just the beginning. The specializations also change up the gameplay quite a bit, which is a great thing because the Black Tusk faction also features a number of changes on the opposing side. 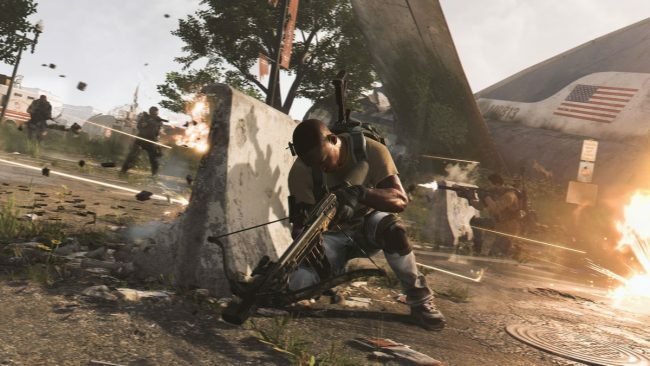 The game persistently gets harder, but The Division 2 also keeps giving you new tools and abilities to overcome those challenges. It’s not just a power climb, but an actual evolution of the way you play the game. This mantra of evolving not only the difficulty, but the mechanics, makes the endgame a very compelling grind, rather than a repetitive one. At this point in the game, your gear also shifts to “gear score” instead of levels, with the average score of all of your gear calculated into your character’s overall gear score. This is when decisions on gear actually start to become more interesting. You aren’t just throwing away weaker gear and weapons anymore. Now you get to look deeper at the stats, intrinsic talents and abilities, and ways that your gear impacts your play style. If the game were to throw this depth out right at the beginning, it would feel overwhelming to many players, but The Division 2 handles its own nuances well. You’re not going to be tossed into the deep end right at the start. That can also mean that there are significant elements of the game that will go unexplored by people content with the simplicity offered. It doesn’t do a great job at explaining some things locked away deep in menus, which I guess is the trade off for simple onboarding. Even as an avid player of these living types of games, I had to explore menus to find Commendations and realize they are like Destiny 2’s Triumphs. 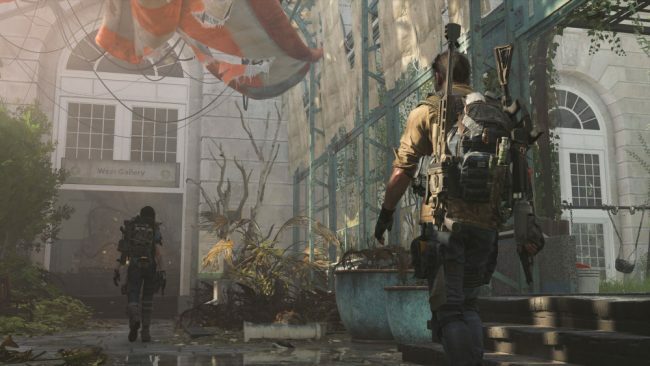 When there are as many aspects to a game as The Division 2, it’s inevitable that some pieces of it will go under the radar of the average player. Fortunately there is plenty of content, so nothing ever feels “missed” if you don’t engage with it, and feels like a bonus when you do discover it. Things like the traditional map/mode based PVP and the psuedo-PVP Dark Zones feel like this. They aren’t necessary if you don’t like engaging with other players, but they are both robust enough to be interesting for the players that do want to spend a significant amount of time there. Here’s where I put on my best TV infomercial guy voice. “And that’s not all!” With The Division 2, the hits keep coming and they don’t stop coming. There’s already a full year of free support announced, with the first extra content headed to the game soon. We’ll get additional chapters of the fall of DC with new strongholds and 8-player Raids to tackle, as well as plenty of unannounced additions to the game. I’m already feeling overwhelmed with what’s in the game at launch, and I can’t believe that we’re already so close to getting even more. If The Division 2 gets even half of the changes and additions that The Division did, we’re in for quite a treat. More specializations are coming (at least three, judging by the image Ubisoft released), and whole new areas will be added to the game, including the Pentagon in autumn 2019. In fact, the additional content coming April 5 is just a precursor to the three massive episodes that are planned for summer, autumn, and winter. That includes new gear to earn, new missions, new bounties, and a whole lot more. Did I already mention that it’s all free? 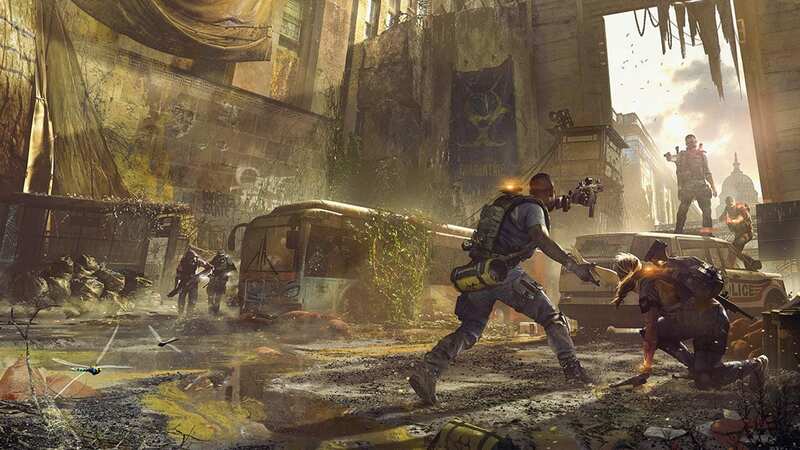 Massive will also be listening to player feedback and implementing that as they go, so The Division 2’s living game will be as dynamic as its open world. The Division 2’s monetization comes from purely cosmetic items like weapon skins and player outfits, and honestly, never once presented as “in your face” at all. In fact, those menus are hidden rather deep in the character customization screen, so you have to be really looking for them if you want to purchase one of the premium outfits. Without paying any money, I managed to randomly find a fun and goofy set of cosmetics for my dude, making him uniquely my own for my playthrough, so there’s definitely not a necessity or even a push to spend additional money. The Division 2 review code provided by the publisher. Version 1.04 reviewed on a standard PS4. For more information on scoring, please read our Review Policy.